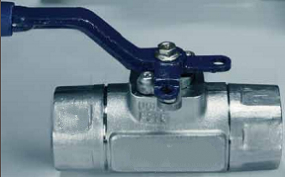 A typical forged steel floating ball valve. Two piece split body, side entry. 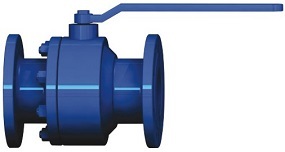 Forged steel floating ball valves are mainly constructed by intricate valve parts made from forged materials. Compared to the cast counterparts, forged steel has fine-grained metallurgical microstructure which has less inclusions and less liquations. 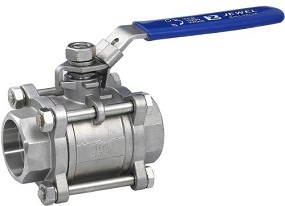 The forged steel ball valve not only eliminates internal defects of cast steel such as microsegration and microporosity but also attains improved omnidirectional mechanical properties as well as better corrosion resistance. 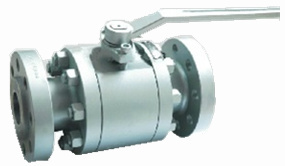 The illustration of design features of forged steel floating ball valve. (1) Double “D” stem head which ensures handle lever will always be mounted correctly, parallel to flow, indicating valve open and closed positions. 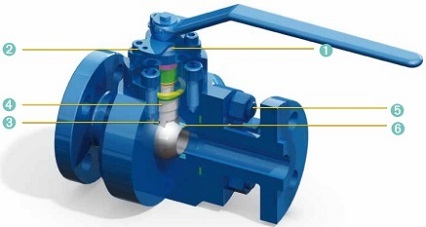 (2) Secure line flow locking device: the valve is equipped with an integral locking device to secure line flow. (3) Anti-static device: Spring loaded pins assures that the electrical continuity between the ball, stem and body, to avoid arcing due to static buildup. (4) Blow-out proof stem: the lower end of the separate stem is T-shoulder shaped to create an integral collar making the stem blow-out proof. (5) Bolted body maintains seal integrity with properly torqued bolting. (6) Fire safe design: metal to metal sealing shuts off valve flow when soft sealing materials are destroyed by fire. The 3D explosive view of a forged steel floating ball valve, side entry & two piece split body design. 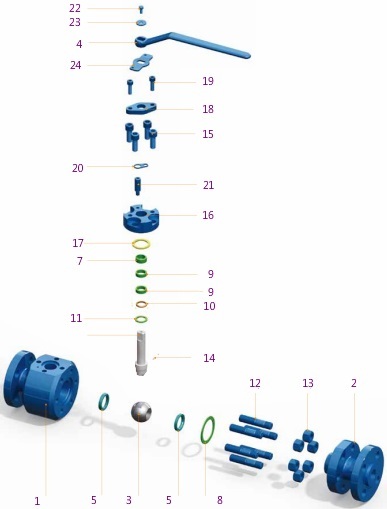 The conventional material selection for forged steel floating ball valves. Other materials are available upon request. See the dimension and weight specification of forged steel floating ball valves 600LB, 900LB, and 1500LB.